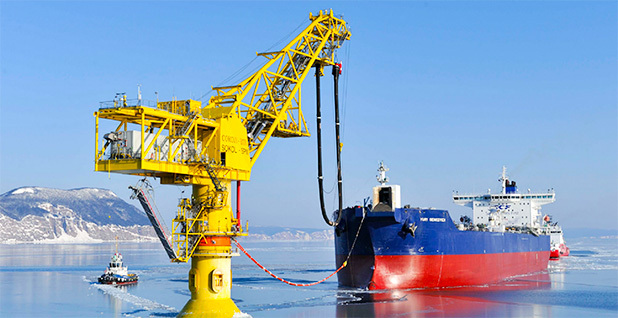 A tanker loads at a mooring station near Russia's Sakhalin oil project. Rex Tillerson, who is likely to be named Donald Trump's secretary of the State Department, played a key roll in negotiating a deal that allowed Exxon Mobil Corp. to explore for oil in Russia. Photo courtesy of Exxon Mobil Corp. The CEO of Exxon Mobil Corp., a shrewd negotiator of global oil deals and a confidant of Russian President Vladimir Putin, is in line to become the United States' next top diplomat. Rex Tillerson is expected to be President-elect Donald Trump's choice to lead the State Department, signaling that Trump intends to dramatically transform the icy relationship between the United States and Russia. If Trump nominates Tillerson, the 64-year-old careerlong Exxon man would bring to the State Department a wealth of experience in forging partnerships with foreign leaders. But Tillerson is expected to face tough questions during a Senate confirmation process about everything from his position on climate change to Exxon's reputation as a ruthless corporation that sidesteps U.S. foreign policy to secure resources and profit around the world — a "private empire," as a 2012 book on Exxon called it. Exxon is in nearly four dozen countries and has operations on every continent except Antarctica. Valued at nearly $400 billion, Exxon is among the world's largest publicly traded companies. Since 2006, when Tillerson replaced Lee Raymond as CEO and chairman, Exxon has continued to aggressively build a portfolio of global oil and gas reserves, including in North America. To get there, Tillerson has been a master negotiator and a risk-taker, often pursuing multibillion-dollar projects in impoverished countries where corruption is rife. Tillerson contends that Exxon's oil diplomacy and U.S. interests are aligned. Yet he's been willing to buck two presidents, and his views on free trade are in conflict with Trump, who took aim at U.S. trade deals during his campaign swings through the American Rust Belt. "I think anything that promotes global energy security is in the U.S. national interest," he told talk show host Charlie Rose in 2013. "And so any steps we take to develop new resources, to promote trading relationships, to promote stability in countries from a socioeconomic and geopolitical perspective, that is all in the U.S. national interest." When Tillerson retires from Exxon in 2017, he will own millions of shares of company stock. As Trump's secretary of State, Tillerson could inflate or deflate the value of his shares by influencing the price of oil. U.S. sanctions targeting Russia's oil and gas sector as a result of Putin's invasion of eastern Ukraine and annexation of Crimea threw a wrench in Exxon's plans to expand its footprint in Russia. Exxon and the Russian state-owned oil giant Rosneft signed a strategic cooperation pact in 2012 to explore the tight oil reserves in Siberia. U.S. sanctions against Russia essentially froze those plans. In 2013, Tillerson was awarded the Russian Federation's Order of Friendship by Putin, a fact the company notes on its website. Almost two decades ago, Tillerson headed Exxon's Russian and Caspian Sea operations, establishing drilling and liquefied natural gas infrastructure on the island of Sakhalin in Russia's far east. Exxon is a descendant of the world's first oil monopoly, Standard Oil Co., which the Supreme Court split up in 1911. To this day, Irving, Texas-based Exxon is incorporated in New Jersey, where John D. Rockefeller ran his conglomerate. Exxon's largest corporate campus is near Houston. Tillerson was born in Wichita Falls, Texas, in 1952. He earned an engineering degree from the University of Texas, Austin, and he started his career at Exxon in 1975. Tillerson has worked there ever since, and he has no experience in the public sector. Rex Tillerson, CEO of Exxon Mobil. Photo courtesy of AP Images. Tillerson competed with another executive for the CEO job after the larger-than-life Raymond announced his retirement. Tillerson's commanding physical presence — he stands over 6 feet tall, with silver hair and an air of confidence — became a selling point at Exxon, said Fadel Gheit, an analyst at Oppenheimer & Co.
"He is the kind of guy that walks into a crowded room and everyone will look at him and say, 'Who is this guy?'" Gheit said in an interview. "He commands attention." Tillerson has likely spoken to more heads of state than the rest of Trump's Cabinet picks combined, and has built relationships by keeping his word over decades, said Gheit, who has followed Tillerson's career for 12 years. That could prove to be a point of friction with Trump, he added. "Rex Tillerson wants a five-year budget, 10-year projections. Donald Trump [uses] one 15-character tweet to tell people what he thinks," he said. Tillerson's compensation was $27 million in 2015, down from $33 million the previous year, according to corporate filings. In 2015, with oil in a steep decline, Exxon still booked a profit of $16.2 billion. When oil prices spiked to $140 a barrel in 2008, Exxon notched what was then the largest annual profit of any American corporation, $40.6 billion. Tillerson owns 2.6 million shares of Exxon stock, which were worth $233 million at Friday's closing price. He has hundreds of thousands of shares that will vest over the next 10 years, according to company filings. Exxon's stock price has gone up about 4 percent to $89 a share since Trump was elected, adding $9.3 million to the value of Tillerson's shares. If Exxon's stock rises to $94 a share, the peak during the 2008 oil-price spike, Tillerson's stake would be worth $246 million. In the late 1980s, Tillerson headed operations in the south-central United States, including Texas and Oklahoma. Exxon shifted much of its attention to the Middle East, and then to Russia, by the late 1990s. In 1999, Tillerson was appointed executive vice president at ExxonMobil Development Co., the division that leads planning, designing and construction of its largest capital projects around the world. The oil industry experienced a wave of mergers in the 1990s, with some of the largest U.S. oil companies combining to become vastly larger entities. Exxon and Mobil merged in 1999 to create the nation's largest publicly traded oil company. Exxon has earned a reputation as a reclusive yet relentlessly plodding oil and gas colossus, unafraid to take on immense technical challenges in some of the most extreme environments on Earth. Exxon's experience in the harsh climate and seas off the island of Sakhalin in the Russian sub-Arctic allowed it to open up offshore oil and gas production east of Canada's island of Newfoundland, in waters plied by icebergs floating south from Greenland every spring. Exxon is on the cusp of expanding its operations offshore from Newfoundland and Labrador. Under Tillerson, the company also executed a technically complex LNG export project in Papua New Guinea. PNG LNG is up and running today. The company is known to be fearless of political risk, as well, cutting deals with dictators and managing operations in politically volatile regions. "All things come down to your personal relationships," Tillerson told Rose in the 2013 interview. "When you're going to make significant commitments, you have to look the head of state of that country eyeball to eyeball and say to them, 'I'm going to make this commitment. And I'm counting on you to meet your commitments, because I will be here a long time.'" President George W. Bush once said of Exxon, "Nobody tells those guys what to do," according to the 2012 book "Private Empire: ExxonMobil and American Power" by Steve Coll. Under Tillerson and his predecessor, the idea that Exxon operated as a "private empire" became conventional wisdom. Securing access to oil meant forging partnerships and extraction deals with dictators the U.S. government either had condemned or had limited relations with. Exxon was a key player in developing the tiny former Spanish colony of Equatorial Guinea from a deeply impoverished backwater with a horrific human rights record into one of Africa's leading oil exporters. The current president, Teodoro Obiang Nguema Mbasogo, assumed power by overthrowing his murderous uncle in a bloody coup d'état. Obiang himself was the target of a botched 2004 coup attempt by U.K. and South African mercenaries. The nation routinely tops the ranks of Transparency International's list of most corrupt countries. Exxon's Equatorial Guinea affiliate is today the leading oil producer there. In 2010, Exxon established an office in Turkmenistan, where the nation's leader, Gerbanguly Berdimuhamedow, has been accused of creating a cult of personality around his presidency. Exxon established offshore projects in post-civil war Angola. The company is a major investor in war-torn Iraq, inking deals to refurbish operations in southern Iraq and a 2011 production sharing agreement with the autonomous Kurdistan Regional Government. Not only did Exxon bypass the U.S.-backed Iraqi national government, but the company didn't tell the State Department about the deal until it was over, Coll wrote in "Private Empire." After signing the deal with the Kurdish government, Coll wrote, Tillerson told State Department officials, "I had to do what was best for my shareholders." In the field of international oil diplomacy, Tillerson is best-known for thumbing his nose at State through his aggressive pursuit of opportunities in Russia. The Obama administration's attempted diplomatic "reset" with Russia failed miserably almost at the outset, and the two governments' relationship began souring during former Secretary of State Hillary Clinton's period as the nation's top diplomat. The 2010 release of classified Department of State cables by the website WikiLeaks revealed how U.S. diplomats deemed Putin's government to be a cynical, hopelessly corrupt kleptocracy with ties to organized crime. A 2015 episode of the PBS TV documentary series "Frontline" alleges the same, adding that Putin may owe his rise to power in part to fostering ties to crime syndicates while serving in St. Petersburg's government. The United States and Russia butted heads at the United Nations over North Korea's nuclear weapons tests and Iran's secretive nuclear weapons programs. But eventually they came together, passing Security Council sanctions regimes addressing both matters. Those instances of cooperation would later prove to be exceptions. Russia vehemently opposed NATO's intervention in Libya's uprising on the side of rebelling forces. Russia and Iran flocked to the defense of Syria's government when violence erupted there. The United States supports rebel forces attempting to overthrow the government. None of this bad blood between the two governments deterred Tillerson's Exxon from pursuing major deals with Russia, right up until, and even after, Russia's invasion of Ukraine. In 2012, Tillerson flew to Russia to oversee the signing of agreements with Rosneft President Igor Sechin that would expand on plans to jointly develop new sources of crude oil in Siberia and the Russian Arctic. The agreements, signed with Putin in the room, also called for joint offshore energy exploration in Russia's Arctic (Energywire, June 18, 2012). Ukraine's political crisis erupted less than two years later. Putin became further isolated from the West following the downing of a Malaysia Airlines flight over eastern Ukraine skies, likely from a Russian-supplied surface-to-air missile fired by Ukraine anti-government forces. Tillerson continued to defy State on its Russian policy well into this year with a move aimed at ending Putin's isolation. In June, the Exxon CEO participated in a forum held in St. Petersburg with a delegation of executives and politicians, led by European Commission President Jean-Claude Juncker. Tillerson's participation defied a direct recommendation from the State Department. According to the Associated Press, Tillerson made light of the lack of U.S. government representation at the event. On Iran, Tillerson has expressed more neutral views. Trump has talked about reinstating sanctions on Iranian oil exports, which would require the cooperation of European powers. In a March interview with CNBC, Tillerson noted that U.S.-based oil companies are barred from doing business with Iran, leaving them out as European oil companies seek deals with Tehran. He said Exxon would look for opportunities in Iran if it could. But he didn't see Exxon as "necessarily at a disadvantage" from the ban on U.S. company dealings with Iran. "The history of Iran, in foreign investment in the past, their terms were always quite challenging, quite difficult," Tillerson said. "We never had large investments in Iran for that reason." A lifelong oil man, Tillerson sees the world through a sheen of crude. Under his tenure, Exxon has stood out from its supermajor peers by almost entirely shunning investments in renewable energy, aside from forays in advanced biofuels research. Executives there have long dismissed electric vehicle technology as a niche curiosity unlikely to challenge oil's dominance in global transportation anytime soon, if ever. Tillerson's Exxon is well-known for taking an extraordinarily long-term view around investing. The International Energy Agency largely agrees with Exxon's view that fossil fuels, particularly oil and natural gas, will power the majority of the planet for some time to come. But for more than a decade, Exxon and its peer group of companies have been plagued with problems that pre-date the recent oil price crash. The oil and gas multinationals have grown so large that they've found it difficult to maintain their reserves replacement ratio, a key metric used for valuing their businesses. Exxon and other producers are constantly depleting their reserves as they pump oil, so they search relentlessly for new sources. Replacing 100 percent of its reserves means an oil company has maintained its overall size, neither expanding nor contracting. Several supermajor oil companies have struggled to do so. When oil majors were flying high before the oil price crashed in 2014, cash flow declined as capital expenditures skyrocketed. Credit Suisse analysts blithely noted that "no major has covered themselves with glory" (Energywire, April 14, 2014). Still, of the top eight European and U.S. oil companies, Exxon stood out as revenues outpaced its rivals. But Tillerson's Exxon has warned shareholders that Securities and Exchange Commission rules could force it to drastically write down the value of its reserves this year. Exxon has stood out as a lightning rod for climate activists and attorneys. It has resulted in inquiries by state attorneys general in New York and Massachusetts and by SEC investigators. Under Raymond, Exxon contributed millions of dollars to a web of think tanks and foundations that argued against the idea of human-induced global warming. Tillerson has expressed at least partial acceptance of the science underscoring the reality of climate change, and since he became CEO, Exxon has halted its funding of efforts to sow doubt on climate science. But Tillerson has said that he opposes government policies that would put strict regulations on emissions of greenhouses gases or limits on fossil fuel consumption, arguing that such measures would cause economic harm far in excess of any potential environmental benefits that might be derived. Instead, Exxon and Tillerson view climate change as an engineering problem that can be managed by, for instance, protecting coastal areas from rising seas (Energywire, May 29, 2014). "How do you want to deal with that great social challenge?" Tillerson said at Exxon's annual meeting in Dallas in 2013. "What good is it to save the planet if humanity suffers in the process of those efforts, if you don't know exactly what the impacts are going to be?" (Energywire, May 30, 2013). Tillerson and Exxon have criticized the scientific models that link global emissions of carbon dioxide to rising global temperatures. At the 2013 shareholders' gathering in Dallas, Tillerson openly dismissed an audience member's assertion that scientists agree that concentrations of greenhouse gases in the atmosphere must be brought down to 350 parts per million or lower to avoid future catastrophe. "I cannot conclude that there's something magical about 350, because that suggests these models are very competent, and our examination of the models are that they're not that competent," he said at the time. "To suggest that 350 versus 450 is somehow a known outcome is just not respecting the competency of the models." 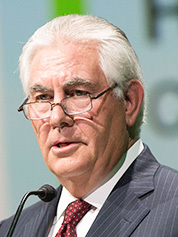 While at Exxon, Tillerson has encouraged philanthropy, in particular support for university-led research and development. For instance, the company recently donated $15 million to Tillerson's alma mater. It committed funds to boost the University of Texas, Austin, Energy Institute's research aimed at "integrating renewable energy sources into the current supply mix and advancing traditional energy sources in ways that improve efficiency and reduce effects on water, air, and climate," the university said in a release. The company is also well regarded for its efforts to encourage young girls and women to consider pursuing careers in so-called STEM fields, an acronym for science, technology, engineering and mathematics. Each year, the oil giant hosts schoolgirls at corporate offices in Houston, where female Exxon scientists and engineers mentor them in projects. Exxon announced in 2015 that Darren Woods, who previously was chief of the company's refining business, will likely succeed Tillerson in 2017.